Erring officials of the municipal corporation faced the wrath of municipal councillors and local MLAs during a house meeting here today. The municipal house which met almost after four-and-a-half months here today witnessed a lot of hue and cry as there were various topics to be discussed and the time limit was short. Dr Dulcha Singh Brar, director, Students Welfare, Punjab Agricultural University (PAU), the accused in the sexual harassment case, is learnt to have been put under suspension and sent to his parent cadre- the department of entomology. Though the authorities are tightlipped and have still not confirmed about the development, sources reveal that Dr M.S.Kang, the VC PAU, signed on Dr Brar's suspension orders before he left for Italy on an official tour today. Though political blame game always rules the floor of municipal houses, the Ludhiana municipal house meeting today witnessed a little different pattern. A 30-year-old woman today alleged that she was molested by a doctor in Krishna Charitable Hospital when she had gone to get herself checked for spondylitis. Owing to power cuts imposed for hours everyday, residents here are being exposed to toxic fumes billowed out by power generators in the most-polluted city of the state. The entire scape of the city is stamped with images of power generators. Gone are the summers, however, the power cuts continue. Thousands of private residences and business establishments have installed the power generators. In absence of any government action on ground, hapless citizens breathe polluted air and hear harmful sounds. SPS Apollo Hospital, Ludhiana, organised a disaster management drill designed to familiarise healthcare and civil administration officials with the topics of readiness and first response to large-scale emergencies. Entitled "Emergency preparedness: safeguarding public in new era," the drill featured the senior officials from the hospital sharing expertise they have developed to respond to terrorist attacks. Cotton growers in the cotton belt are reportedly being fleeced by the Cotton Corporation of India (CCI) and private ginners for alleged poor quality of the staple and high trash content. Accusing the present executive of the district IMA of misappropriation of funds, former district president of the IMA Dr Gursharan Singh has questioned the office-bearers about the hasty withdrawal of an amount of Rs 1, 53, 933 in a span of four days that is from December 4 to 9. The medical education unit of the DMCH conducted a national workshop on Microsoft Power Point today at Dumra Auditorium. As many as 40 participants attended the workshop which aimed at imparting the skills for preparing good power point presentations. 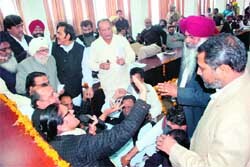 The workshop was awarded four credit hours by the Punjab Medical Council. Dr Manjit Singh Kang, VC, PAU, is heading the 15-member high-level Indian delegation to Italy that comprises eminent professors, scholars and researchers from leading Indian universities, research centres and the institutes. The delegation will be meeting in the morning of December 15 with high-level officials of the Campania Region, eminent Italian scholars and researchers. The meeting will be on the theme "Scientific Cooperation between India and Italy". As many as 110 doctors participated in a CME (continued medical education) on diabetes mellitus organised by the Physicians Association, Ludhiana. The epithet "Government for the people" belies the statement. The government's tall claims of doing a lot for the welfare of the education seem to be hollow. The dilapidated portion of the building of Government Multi-purpose School tells volumes of the government's indifference. 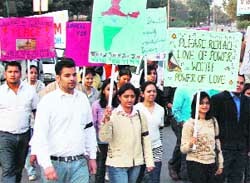 University Business School conducted a peace rally to pay tribute to the martyrs, who lost their lives during terrorist attacks in Mumbai recently. The rally commenced from UBS campus, Fountain Chowk. A school fair “5th India International Premier Schools’ Exhibition” will be hosted at Majestic Park Plaza on December 13 and 14. It is being organised by AFARS Exhibitions and Media Pvt. Ltd. Besides the schools from other parts of India, the day schools from Ludhiana are also participating with other boarding schools from Punjab. National College for Women, Macchiwara, organised a face-to-face interaction (rubru) with the renowned Punjabi poet Prof Pritam Singh Rahi in collaboration with Punjabi Sahitya Academy, Ludhiana. Prof Rahi elaborated his family life and his contribution to Punjabi poetry. 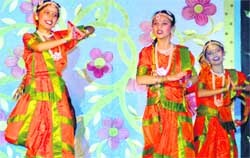 “Rishtey”, a Punjabi play, questioning marriages being used by NRI Punjabis as a means for getting their relatives abroad was staged to a packed auditorium at Pal Auditorium of Punjab Agricultural University on Wednesday evening. The play argued that a pious bond had been rendered into a material exercise polluting the waters of human relations. Superintendent of Police, Gurmeet Singh Randhawa, was on Wednesday elected president of the PPS Officers’ Association unanimously during a general-body meeting of the association held here. A foetus, said to be about approximately six months, was found near Balion village at about 5:30 pm today. The returning officer (RO) of the District Bar Association (DBA) Ashok Mittal has issued a show-cause notice to those contestants who have still not removed their posters and banners from the Judicial Complex as well as the Lawyers Chambers Complex. The State Consumer Disputes Redressal Commission has set up one more bench of consumer forum in the city keepig in view the huge pendency of cases here. Chairman of the State Commission S N Aggarwal will inaugurate this bench tomorrow. Rishab Dev from Punjab and a trainee of Harvest Tennis Academy, upset top seed Vishal Passi from Maharashtra in the ongoing AITA Super Series Tennis Tournament being played at Harvest Tennis Academy at Jassowal, Ludhiana. After losing the first set 4-6, Rishab forced back to the game in second set by 6-4. It proved to be a wake up call for Vishal Passi, who made a comeback of sorts in final set but it was too late in the day as Rishab won the deciding set 6-3. The set went against the serves most of the time.